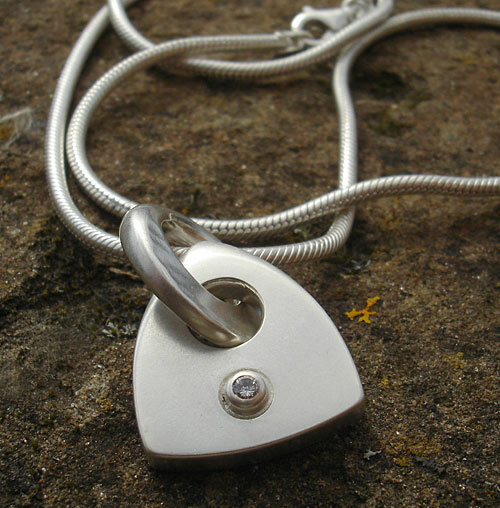 Triangular Diamond Sterling Silver Necklace : LOVE2HAVE in the UK! A triangular silver diamond necklace. The triangular logo pendant comes in a matte finish and is handmade from solid sterling silver. 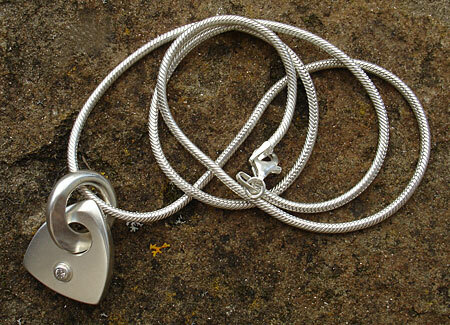 The silver pendant with its ring loop measures approximately 25mm high. The triangle represents true feminine spirituality. It is a symbol of high power denoting the divine female goddess and the truth in her wisdom and knowledge through the number three. This number is representative of the spirit realm or the Heavens and connected to the Celtic idea of a trinity. It is quite a chunky piece and features a very attractive and stylised hole upon which the silver ring loop is threaded. This loop has a contemporary tapered shaping to it threaded onto the necklace itself. A shiny white diamond is set below the hole in a cup style setting. The silver snake chain measures 16 inches in length.